Last night on The Daily Show, Jon Stewart addressed the several domestic abuse cases that are currently bringing scandal to the NFL and the disastrous way that the organization has handled them. "You know your business model is in rough shape when you need to appoint your own in-house Special Victims Unit," he began. 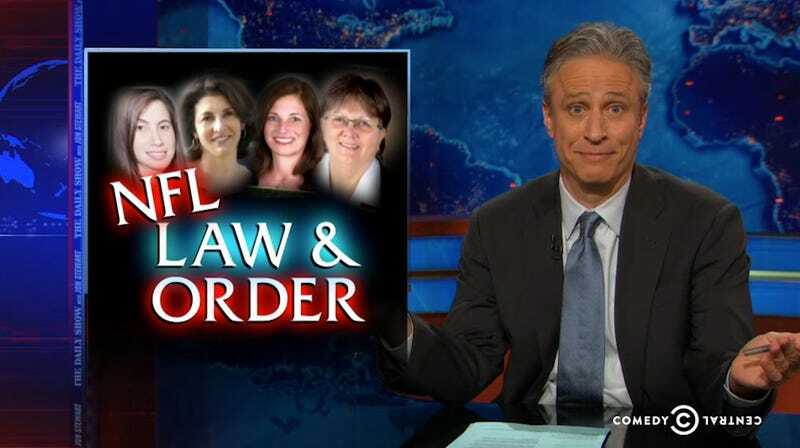 So What&apos;s Actually New About The NFL&apos;s New Domestic Violence Policy? Stewart touched on the Ray Rice case (something he's explored at length before) and a few other incidents, but spent the bulk of the segment discussing the Vikings' Adrian Peterson, who is being charged with reckless or negligent injury to a child after beating his four-year-old son with a switch. Despite the charges, Peterson — who admits to hitting his kid — announced in a statement that he, "without a doubt, is not a child abuser." "You beat a four-year-old with a tree branch," Stewart responds. "Here's a tip for any pro footballers out there curious as to whether or not they may be child abusers: You can't do something to a four-year-old that you're not allowed to do to a 300-lbs lineman in a helmet and pads."